Edward's fast, fluid style in which he works is evident in each and every one of his pieces, echoing the buzz and bustle of city life. It was in a New York diner that the idea of using ketchup bottles occurred to him; a technique that has since come to be the trademark of his paintings. Edward has already achieved remarkable success, with several sell- out exhibitions under his belt. 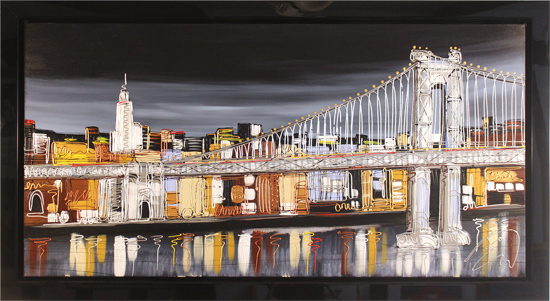 His bold, dynamic style has captured the attention of collectors worldwide, with many galleries clamouring for his work. Read the full Edward Waite biography.